The Dark Tower Beckons Me. | What I think About When I Think About Writing. The Dark Tower Beckons Me. Most readers will know what I mean when I say that there are those books that you just won’t read. The reasons can vary, and at the end of the day, they don’t really matter. It’s all about taste and whatever floats your boat on any given day. I have no particular genre when it comes to reading. I’ve read the lot: mystery and suspense; horror and ghost stories; science fiction and fantasy; westerns and historical fiction; romance and Young Adult. I read The Exorcist and The Godfather at the age of twelve. I ‘murdered’ Agatha Christie novels like I was a serial killer. But when my reading really took off, it was Stephen King I turned to. Carrie, The Shining, The Stand and It remain to this day books I would carry with me to a desert island. But I could never take to The Dark Tower series. I read The Gunslinger when it came out first. I read it again when the revised edition was published in 2003. I didn’t…couldn’t…wasn’t drawn to The Drawing of the Three. I’ve been badgered (in a nice way) by my writing group to give the series another go. So I will. It’s been seven years since I read the first in King’s seven book sequence. It’s all about the number seven. I’ll start soon with The Gunslinger and – heaven help me – I’ll hit the second book straight after. I’m a reader on a mission, and I’ll keep you updated on my progress. Wish me luck. This entry was posted in Reading, writing and tagged Agatha Christie, Stephen King, The Dark Tower, The Drawing of the Three, The Exorcist, The Godfather, The Gunslinger. Bookmark the permalink. You won’t need luck once you really “get it.” I only wish you adequate sleep, my friend. I get the felling that I’m ready for it this time. Thanks, MJ. Single greatest fantasy epic ever. 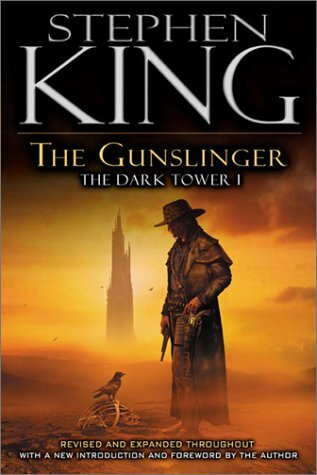 Also, if you’re a King fan, it is virtually impossible to understand the entirety of his work without the Dark Tower. It’s literally a Rosetta stone for the rest of his novels. Now I’m stoked. Thanks, Julian. Julian took the words right out of my mouth. Bon courage and happy reading. Don’t be put off by the leisurely pace of the first book. Try book 2 before you are certain of anything. We are ka-tet, Jimbo. Enjoy. I just finished Gunslinger for the first time last week and am lined up for book two. Not sure what I think about it so far. king is a master storyteller to be sure, but I haven’t made up mind if I like this series or not.